LG has been one of the big players in the mobile market rather challenging the Korean Giant Samsung and Apple with their flagship G series and the other LG V10 the earlier year went great we have seen many new devices and rather one of the greatest innovations in them but this year we are expecting more than the previous and as MWC is just hours away to kick off LG has launched its flagship devices the LG G5 to challenge the upcoming Galaxy S7 and other next generation devices. On the physical appearance LG G5 had changed a lot from the previous iterations this time the device has a full aluminum uni body design and the volume rocker are back to its common place which is at the sides which is due to the dual camera setup at the back but still the power button is at the back below the camera setup which now supports a fingerprint scanner which was missing from the LG G4 the camera setup does protrudes a little but still the device is at the flat side and power button is still a press type , the micro-sd slot and the sim card tray is located at the right edge . At the top we have the 3.5 mm audio jack as well the IR-plaster and the secondary microphone for noise cancellation . At the bottom we have the speaker grill and the USB Type-C charger and the primary microphone . Coming to the front have the display and the LG logo at the bottom and the top the usual speaker grill for call the front facing camera and the usual sensors. The edges og the LG G5 are curved and there is a subtle curve at the top and the bottom which the LG the 3D Arc design. Now the unique feature of the new LG design language due to the unibody design the device back cannot be opened and so the long discussion of the user replaceable battery takes place well so LG has its own way for solving this problem in LG G5 the battery is still user replaceable but now with a new way by removing the bottom compartment of the device yes, there is a button on the bottom edge of the LG G5 which we would have to press a little harder to pop out the bottom compartment of the LG G5 to easily change the battery like in the concept of modular design and so using this as an advantage LG had also introduced many other modules that can replace the bottom compartment and gives you more functionality like the special camera module the LG calls LG cam Plus which gives you physical controls over the camera like a button to launch the camera app directly and slider for zooming also as this is specially made for camera it also gives you 1200 mah of extra juice as camera takes a lot of battery and the other module like the one from Bang & Olufsen called LG Hi-Fi Plus specially for music listeners which gives you to listen music with 32-bit Dac support and a 3.5mm audio jack for that too. LG decided to decrease the display size from 5.5 inches to 5.3 inches for LG G5 well the screen size may not affect until the display quality is good and we must say on LG G4 the newly introduced Quantum IPS display was very great and this time it has improved more .The display is a Quad HD IPS LCD, and it’s nice and bright, with pleasant colors and good viewing angles. As teased by LG the LG G5 supports an Always ON mode that shows the clock and notifications at all times but the question on the battery life arises by the users and well but according to LG the display will eat up 5% of battery life a day as for an average on .8% of an hour and the display will automatically turn off when it is in the pocket.But we still doubt that as the display would be turned on not the required pixels as LG has not opted for the Amoled display panel this time also. The snapdragon 820 was announced the previous year and still its just was announced to be used in Le LeTV Max Pro which was announced at the CES 2016 and now the LG G5 is the second device that supports the Snapdragon 820 we still don’t have any information about the processor potential as there has not been any retail unit so far but we can say that the snapdragon 820 is a beast and is heart of the LG G5 so there would be no compromise with the Flagship standards for 2016 by LG. Coming to the device specifications as said it comes with snapdragon 820 Quad Core processor with new Kryo CPU with 4GB of ram which is enough for seamless multitasking and for intensive gaming it comes with Adreno 530 GPU, and the Snapdragon 820 also incorporates 14-bit dual image processors, a low-powered Hexagon digital signal processor for always-on applications, and Cat 12/13 LTE. 32GB of storage are available and you can supplement that thanks to the micro SD card slot. On the battery side the LG G5 comes with a 2,800 mah of battery which is less as compared to previous LG G4 . 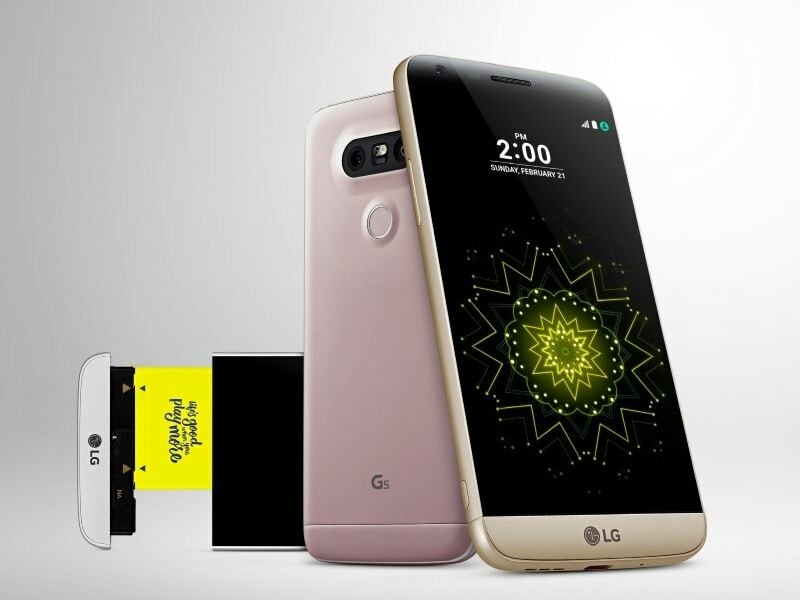 This time the LG G5 comes with Qualcomm Quick Charge 3.0 support which cn charge your device up to 80% in just 35 minutes so it’s a good advantage on the other side also i you rather like a bigger battery than other OEM can take advantage of the LG G5 modular design so to create modules with bigger battery backup. Another upgrade we see in this years LG flagship the LG G5 is the new dual camera setup at the back of the device featuring one normal-angle 16MP camera and one wide-angle 8MP camera with dual tone flash and laser guided Autofocus system.Using suitable algorithms the camera analyze the scene and then the phone stitches the inputs from the two cameras into one image. You can switch between the wide-angle (135 degrees) camera and the regular one manually from the camera app, and the instant transition is pretty impressive but yet its still noticeable on the other side we found the camera is one of the best and have a lot of potential but still as this is not the last unit so we keep up the camera impression on hold for now its very good. now LG has taken a great leap from its earlier UI the LG G5 does not have any App Drawer and the icons are now more good and better designed also the gimmicky features are also removed but every thing has its bad side and for LG G5 it is that there is no multi-window or Q-slide as said many features have been removed but many good ones are also not available and we expect that they are available in the retail unit as for now they are not in list.